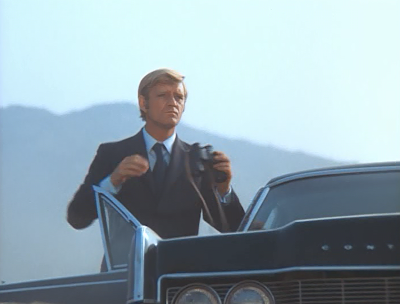 Fletcher (Don Knight) chases Ben Richards (Christopher George) onto a Native American reservation in the desert. Richards’ dune buggy breaks down in that territory, and he is unexpectedly aided by the land’s rebellious youth, and its leader, Tsinnajinni (Sal Mineo). He befriends Tsinnajinni, who has a bad impression of the white man, and his culture. Meanwhile, Fletcher plans a full-scale assault on the reservation to attain his quarry. 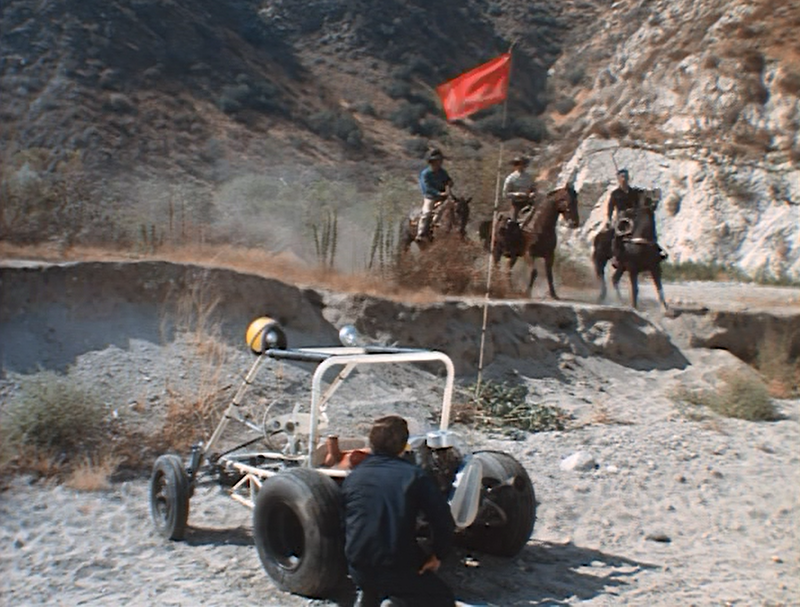 On the reservation, Richards attempts to repair his vehicle. For my money, “The Sanctuary” is the least interesting episode of The Immortal (1969-1971) in the entire series run of sixteen episodes. The narratives trades in old clichés about Native Americans, fails to cast Native Americans in the central roles, and adds nothing to the series’ mythology…or even Ben Richards’ character. The episode attempts to be progressive, I suppose, in some ways, but just ends up looking and sounding clichéd. Time has done it no favors. 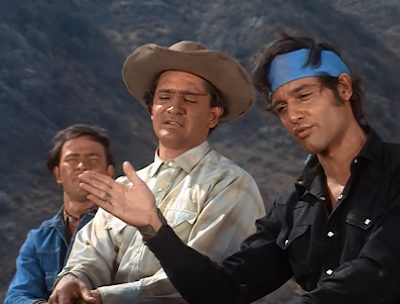 The episode begins with the non-Native American playing a Native American Sal Mineo making critical observations about white men and white society. “You’re always fighting a war for a cause,” he says with dissdain. This is not a small matter in the age of the Vietnam War. By episode’s end, however, we’re in straight-up “White Man’s Burden” territory as Richards lectures the young man about life in the city. He turns patronizing and asks him “Are you ready for it?” Who is he to decide, really? Is he ready for it? What has been his experience, based on what we’ve seen? Also, the episode ends in hackneyed format with the leader of the Native American tribe offering to say a “chant” for Richards, as he continues his journey. It’s all clichéd, and condescending at the same time. The worst part of the episode, however, is that it just plays as dull. 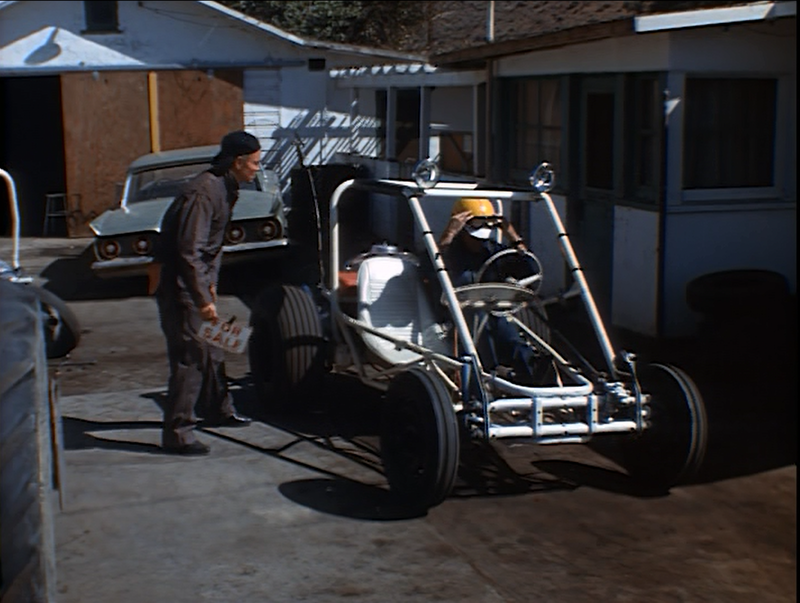 We know Richards is going to win over Tsinnajinni, get his dune buggy working, and be on his way. At this point, the almost-weekly love interest would have been welcome! 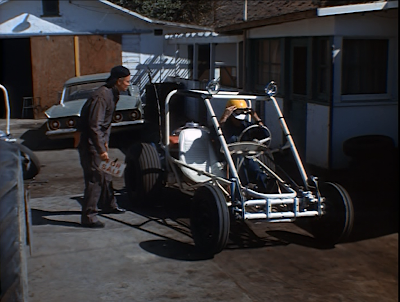 For me, the most unique aspect of the episode finds Fletcher bribing one of Richards’ white friends at a local auto repair shop for the use of a vehicle, so he can launch a full-scale attack on the reservation. In this episode, Fletcher basically wages war, with vehicles, soldiers, and explosives against the Native Americans on the reservation. This subplot actually does have some cultural currency for 1971. Not only is it a callback to a grim chapter in American history, with westerners attempting to take the land of Native Americans, but it works as a metaphor, of sorts, for Vietnam, with soldiers bringing their advanced war technology to another culture, without really understanding the “enemy” or the terrain. But this idea, like most in “The Sanctuary” is not very well-explored. I kept waiting for that cute squaw to show up and catch Ben Richard's eye, but to no avail. I don't know whether to feel relieved or disappointed. Truth be told, I enjoyed this episode much more than you seem to have done, although I agree that the scene with Fletcher and the attendant is powerful and sad. There seems to be a motif running throughout this series, a message of sorts: Be kind to others, and your kindness will be rewarded. Although I'm not so certain that Ben is being kind, so much as he's going with the flow of whatever events he finds himself in. It's practically becoming comical to watch Fletcher gloating over Ben's capture, only to see him rescued time and again. How many chances does he get before Maitland gives him the sack? Then Fletcher could work with Ben to help him escape! There's a twist I'd love to see! Also, did you notice that the opening credits were slightly different this time around? Since many of the scenes used came straight out of this episode, I have to wonder if the series was exploring what would later become a regular part of the opening credits for one of our favorite shows, Space: 1999. What I most appreciated about "Sanctuary" was that it truly seems as though Ben cheated death in this episode. I wonder, when he was lying in the desert, if he was really dead? We don't receive an answer, but it certainly seems like he was. In some respects, it really was "magic" that brought him back from the dead. It's hard to believe that there's only one episode left of this series. We've come a long way, baby...to paraphrase cigarette ads popular at the time. Looking forward to the series finale. I agree that this episode looks dreadfully dated, and is full of cliches. However, there is something of a theme - the Sal Mineo character puts a price on everything (it seems), and we see proof that even a 'friend' (the guy in the garage) can be bought. But when it comes down to it, Sal gets to choose between being bought off by Fletcher (who offers him vast amounts of quality land), or sticking to his traditional homeland. It's at this point that we find that the tradition outweighs any monetary value. That aspect of the story just about keeps it interesting. As does some of the stuntwork. Not a car chase this time, but a horse/truck chase!